You have to be at least 21 years old to purchase cannabis at Barbary Coast and enter the adjacent lounge, which accommodates about 40 people in the smoking room and about a dozen at the dab bar. Customers are asked to stay no longer than 30 minutes. BYO pot, concentrates and edibles are prohibited. Prior to the start of adult-use retail cannabis sales in San Francisco last week, eight dispensaries were permitted to operate consumption lounges. The city’s cannabis czar said all eight would serve the adult-use customers after receiving retail sales licenses from the state. 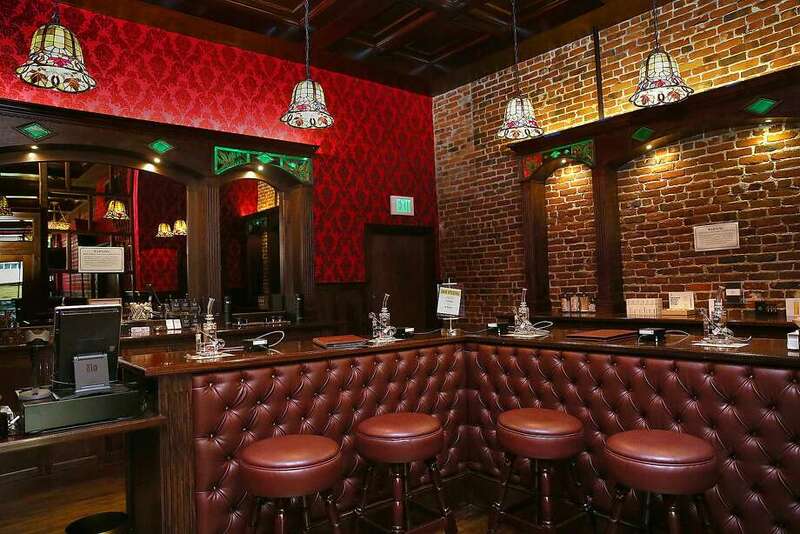 To date, only two San Francisco dispensary/lounges have received state adult-use permits — Barbary Coast and ReLeaf Herbal Cooperative, which has not yet opened its smoking room for adult-use customers. ReLeaf and Barbary Coast are located two blocks away from each other but are worlds apart. ReLeaf’s “lounge” is a throwback to San Francisco’s gritty dispensary past: a spare room in which to smoke a joint or bowl if you have nowhere else to go, like residents of nearby skid row hotels. Barbary Coast, meanwhile, is San Francisco’s future, featuring an enclosed smoking room and state-of-the-art ventilation systems that exceed city requirements, high-end VapeXhale vaporizers and quartz-glass dab rigs customers can borrow and trained staff to help customers consume safely and monitor for over-consumption, all amid exposed brick walls, handsome dark-wood bars, stained-glass chandeliers, flocked-velvet wallpaper and leather banquettes evoking classic San Francisco steakhouses and whorehouses. Permitted for more than a decade and tolerated since the earliest days of the city’s medicinal cannabis community in the 1990s, San Francisco cannabis lounges are models of public use in social settings. Coincidentally, all of these dispensaries are clustered in the South of Market district, centrally located to the city’s prime downtown tourism and culture attractions — hotels, shopping, museums and entertainment. With Barbary Coast’s opening, it looks like Denver is now playing for second. A coffee shop named The Coffee Joint recently submitted its application to the city to operate a lounge that charges customers $5 to bring and consume their own pot. Alaska has pondered lounges three times and punted three times in the past two years. Massachusetts and Maine have broached lounges in drafts of their legalization legislation. This week, Las Vegas tabled a plan to pursue pot lounges, citing fear of federal interdiction. Barbary Coast’s Henry addressed the biggest fear politicians and law enforcement have about pot lounges. Read about San Francisco’s history of cannabis firsts. Read about San Francisco’s other historic pot highlights.